I don’t even know why I haven’t made it earlier; I am talking about almond milk of course 😀 ! Since normal milk (aka: cow’s milk) is not my choice anymore, I discovered almond milk in supermarkets. Well I have to admit that it tastes amazing and it has a lot of flavor in it, but when my obsession with reading labels has been unleashed, I wasn’t truly happy with all the ingredients, especially with the 2% almonds mark. What the f..k? If its almond milk, I believe it should contain more than 2% almonds in it right? Don’t get me wrong, it’s an amazing substitute for cow’s milk, for multiple reasons that we are going to talk about in the following lines. This being said, I started to consume almond milk at breakfast, maybe with cereals or maybe with some crackers or even as a substitute for cow’s milk in some cookies (muffins in particular)… and felt great, nothing to say about this type of milk; I love especially the one produced by Alpro. · I soaked the almonds for about 12 h (this is my option, but you can soak them between 3-24 h before you make the recipe) and the dates normally for about 2h and then you can keep them in the fridge without the water until your almonds are also properly soaked (accidently I forgot to take them out of the water and they soaked for about 6 hours, becoming less sweet…but no problem 😀 ). 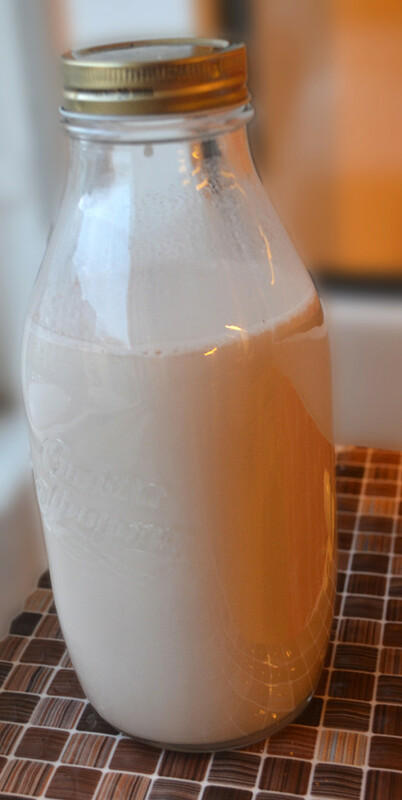 · I put in my blender (a high speed one, but not necessarily) the drained almonds, the drained dates, 3 cm of vanilla bean + 1L of water and I started blending all up in a magical whitish, milky drink. You can stop blending after you see that all the ingredients are properly mixed and turned into milk. 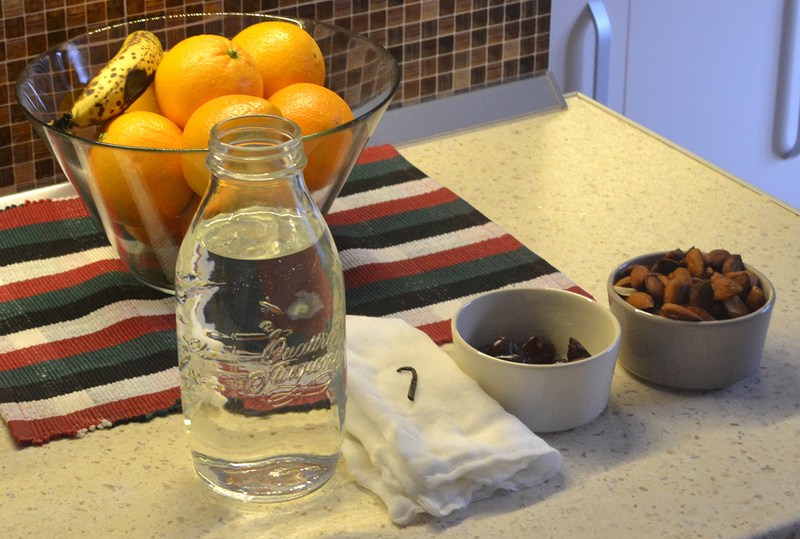 · You take the beverage and you drain it through your nut-milk bag or through a gauze; if you don’t have any of those you can use just a thin kitchen towel or a thick strainer. The idea is to separate the pulp of the almonds from the liquid milk. 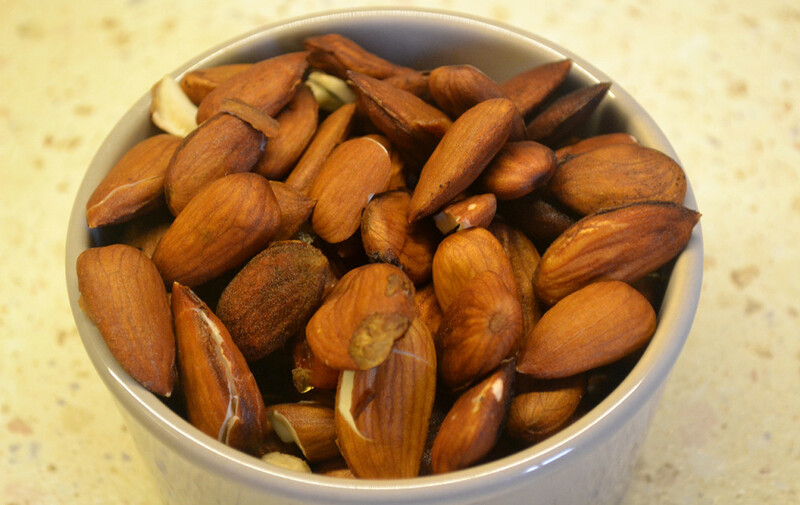 · After you strained the milk you can keep the almond pulp into the freezer and you can use it for cookies or other recipes that contain almonds. The milk you obtained you can consume it as it is and it is ok to store it in the fridge for a maximum of 3 days…although it never lasted 3 days in my fridge 😀 …that’s all! Almond milk is an amazing drink and a perfect substitute for cow’s milk, for multiple reasons: it’s tasty, creamy and satisfying, rich in vitamins, contains no cholesterol, very high in calcium, perfect for those who are lactose intolerant (the majority of us are, but just don’t know) and it digests better. Last but not least it’s environment and animal friendly (these 2 are the big ones). I can assure you that you won’t miss you regular milk and you will like it better anyways, because frankly it is much tastier. Mi-ai facut pofta,pun in practica!! !